Have you ever thought about bringing part of the therapy clinic to your living room? Or have you wondered about making small changes to your home to make it more livable? What about sensory integration? Where would you start? A living room or family room is often where we spend the largest waking part of our day. And the first step in planning a therapeutic living room is to decide if the environment should be calming or stimulating. Then consider the type of activities for which your family typically uses the room and the space needed for specialized equipment or accessibility. Here I’ve collected 20 ideas for two types of therapeutic living rooms: a calming room and a stimulating room. Most of these ideas come from my own home, and some are on my wish list. An overall sense of order is very comforting. A quick way to establish that sense of order is to post the rules that everyone in the family follows. My sister-in-law wrote out her rules on poster board – my favorite on her list was, “Butts will stay in the seat for the entire meal.” I found a pre-printed set of rules that matched very closely to what my family practices. When a problem arises, we review the rules without blaming anyone and explain that the rules apply to everyone, even Mom and Dad. Color definitely affects mood. Bright colors, including bright white walls on a sunny day, can be irritating, and some pastels, such as light blue or light green, can lead to queasiness in a highly sensitive person. Soft, warm, neutral tones, such as beige, cream or peach, support a peaceful mood. Textured, sponge-style painting in similar tones may also have a muted, soft effect. Ask your loved ones for color suggestions, and remember that all of the walls do not have to be the same color, and different pieces of furniture can have different colors to represent their functions. Houseplants are often recommended to soften up a room, but these can be a disaster for a family with special needs. First of all, houseplants get knocked over easily and make a mess. Second, they usually introduce mold, pollen and other allergens to the home, which is harsh on those with asthma and allergies. There are many ways to create hiding and lounging spaces. Some sectional sofas can be set up to face both forward and backward. My family has 2 small sofas at a right angle, with about 3 feet between the back of each sofa and the wall. That narrow space is a favorite place for play. Sometimes we turn one of the sofas to face the wall so that family members can curl up on the sofa and rest. We also have a play tent which we set up in a corner with pillows and stuffed animals inside. Here are 15 ways to make a homemade play tent. 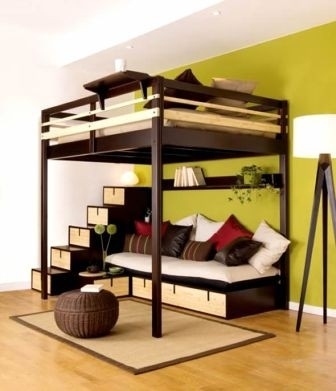 But the ultimate lounging and hiding place is a loft bed with a sofa underneath. The bed can be topped with a bed tent or set up with sofa cushions, and curtains can be placed around the sofa. I know of a school that has bunk beds in the classrooms, which the students use for seating at storytime, class meetings and group presentations. Check for sharp corners and make sure that there is padding in the right places. Occupational therapy clinics often have a “crash corner” loaded with pillows and padding. There should be enough body pillows to sandwich at least one person. Southpaw Enterprises has a kit to make a human “hot dog:” the “bread” is a duvet that can be stuffed with foam cubes, the “hot dog” is a body sock for a person to wear and the “ketchup” and “mustard” are weighted fabric snakes. Natural lighting is best for any calming environment, but in the afternoon, natural light may be too intense. Blinds can control the amount of light in a room, and a dimmer switch provides a sense of control over electric lights. We recently switched to LED lights in our home, which our children immediately protested, because the light was too bright. Fluorescent lights switch on slowly – much gentler on the eyes – but the mercury in fluorescent lights is toxic if the bulb breaks. 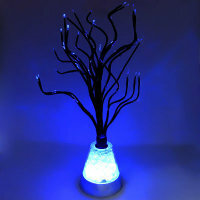 A simple, inexpensive way to make any room calmer is to add a mood lamp. A small night-light size mood lamp costs $6 to $7, and a larger one is usually under $50. I noticed that dark pink or amber colored lamps have a more calming effect on my family than other colors. Mood lamps come in a variety of shapes and styles: egg-shaped, cube shaped, volcano lava, and illuminated salt crystals. A fan on a low setting is calming to watch – and enjoyable for people who love to watch things spin. Having some extra air circulation helps to maintain a comfortable temperature in both summer and winter. We have a portable massage seat from Homedics that we bring out whenever it’s needed. Weighted blankets are recommended as a treatment for various problems, such as insomnia, restless legs and anxiety. The extra weight provides calming sensory input over the whole body. Rolling or bouncing on a giant ball helps to work out nervous energy. Because the round ball tends to get thrown in our home, we have a peanut-shaped double ball in our living room. When I was growing up, my parents liked to hang up posters about science on our walls as conversation starters, and I decided to continue this tradition with my children as an answer to their constant questions about the world. We have the periodic table of elements, a map of the world, a history of the earth, a photographic chart of minerals, a diagram of the water cycle, and a nutritional chart. We rotate these as their questions change. Not only does it help with vocabulary and speech therapy goals, but it is also a magnet for their friends who visit us. Science posters are available at museum gift shops and teacher stores, but I’ve had some luck finding them on clearance at posters.com, too. We also display artwork created by our family and photos to help with memory. We take great care that the images displayed in our home are meaningful and engaging for the people who live here. If a room is infused with an active energy, then it makes sense to choose a color to reflect that. Blues, greens and yellows are generally associated with positive emotions. Again, seek input from family members to make sure that colors do not cause discomfort. We have the Little Tikes Wave Climber in our living room. Some children need something to climb, and this provides a safe outlet for that need. A loft and sofa combination, as mentioned in the calming environment list, is also perfect for encouraging indoor climbing. For smaller spaces, Little Tikes makes the Easy-Store Slide. A few families choose to include an indoor slide when remodeling their homes. When my friend’s house was damaged by faulty plumbing, she had a hole cut in the upstairs hallway and a long slide installed next to the stairs. At my home, we call it the “stand and spin.” This toy is inexpensive, widely available and an excellent way to provide vestibular and proprioceptive stimulation. Many families decide to install a swing in a doorway or in the living room for therapeutic purposes. Occupational therapy catalogs have several different types of swings, and some stores like IKEA have low-cost indoor swings and hanging chairs. But before you decide on a style, read through the do-it-yourself instructions for swing installation here. My husband insists that a stereo system with balanced sound is necessary for those with highly sensitive hearing. If the treble is too high, music or a movie will be painful. If the bass is too high or too low, it can cause discomfort in the whole body. Test entertainment equipment before purchase to be sure that it will not cause problems. My family has had success with games that require visual tracking and visual-motor coordination such as classic pinball and air hockey, so we made space for an old arcade-size pinball machine. Consider what the family enjoys doing together, and plan the room around that activity! A basket of fidgets is a great way to keep hands busy during down time, and they make excellent conversation starters, too. At most garage sales, exercise machines such as stationary bike, rowing machine or elliptical are available for a very low cost. I bought a stationary bike that needed some repair for $10 and a Firmflex resistance workout machine for $5. My son uses these when he wakes up before everyone else in the morning. All that fun stuff needs to go someplace when you’re finished playing. Open shelving at an accessible height can reduce anxiety by keeping everything visible. We got several small, padded storage ottomans at Walmart, which are used as seating, stepping stones between the sofa and climber, end tables and toyboxes. Most adults who visit our living room politely refrain from commenting. But the children who visit cannot stop exclaiming in delight, even when all the toys are away. That’s how I define a therapeutic living room. Karen Wang is a Friendship Circle parent. You may have seen her sneaking into the volunteer lounge for ice cream or being pushed into the cheese pit by laughing children. She is a contributing author to the anthology "My Baby Rides the Short Bus: The Unabashedly Human Experience of Raising Kids With Disabilities"